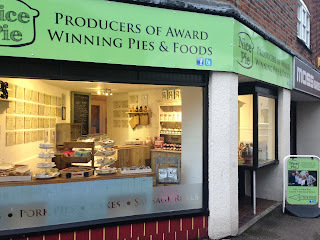 continue reading "Nice Pie open a new Melton Mowbray Shop"
As we said last year when we last sampled some of the "Nice Pie" range, one of the challenges for a Pierateer in British Pie Week is how to fit in all the pies you want to eat and rate - and then having time to write up all the reviews after! That's my poor excuse for why it has taken a while to write up our reviews of the three brilliant Nice Pie flavours we enjoyed in Leeds on Day Six of British Pie Week 2017, but here they are! Long term fans of Pierate will know Nice Pie have produced countless Pierate Highly Recommended and Pierate Recommended pies - including, but not limited to, their kangaroo, zebra, wild squirrel and crocodile exotic pies - in fact, see the table of past Nice Pies here! 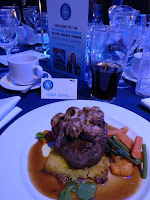 The pies we had this time were some more from the traditional menu - the Slow Cooked Lamb and Mint pie, Chicken, Gammon and Mushroom pie and Beef in Red Wine and Roasted Marrow Bone pie. All three were new to us, but had all had a strong showing at the recent British Pie Awards. 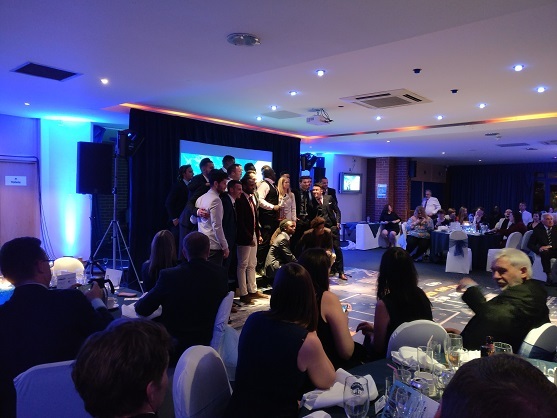 The Beef in Red Wine and Roasted Marrow Bone pie won the "Beef and any flavour" Class and the Chicken, Gammon and Mushroom pie won the "Chicken and other meat" class, while the lamb pie had got a gold award (90%+). These are award winning pies!!! 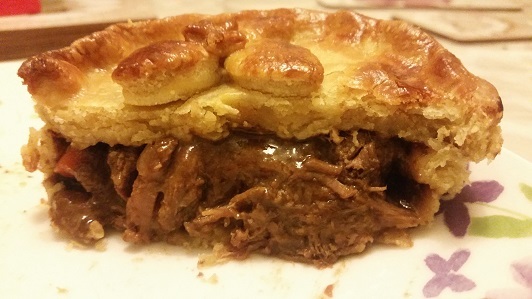 ﻿As we've mentioned in a number of Nice Pie reviews before, it was the filling that really stood out in these pies, absolutely bursting with meaty chunks that were so tender and flavoursome. It really amazes me how they can pack so much meat into these pies, as the capacity is always so full to the brim! The only slight downside is that with so much meat in there it can mean the pastry struggles to hold all the filling in, especially if you try to eat it by hand as I did. This is however a very small criticism as the main thing is to have a packed, flavoursome pie filling and this pie certainly provides that, especially complimenting the crisp butter shortcrust pastry that Nice Pie are renowned for! Out of the three pies, I personally preferred the Lamb and Mint Pie and thought that stood out amongst other lamb pies I've had. 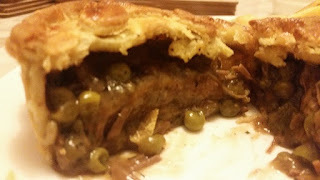 Unlike many lamb and mint pies which are absolutely smothered in mint and lacking in meat, this was a perfectly balanced flavour and full of tender meat. The lamb easily shredded when the knife cut through it due to it being slow cooked, so while the pieces of meat were quite large it did not feel too big. 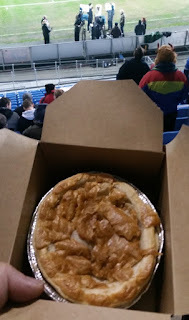 I could have happily kept eating this pie all night! 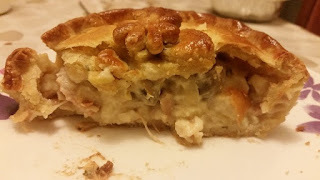 The chicken pie was again packed with meat and although the pastry was a little flaky it still managed to hold in all the content well! The sauce was very nice and complimented the meat flavour well, and once again we struggled to fault much as it was a very good filling! A traditional flavour done well! 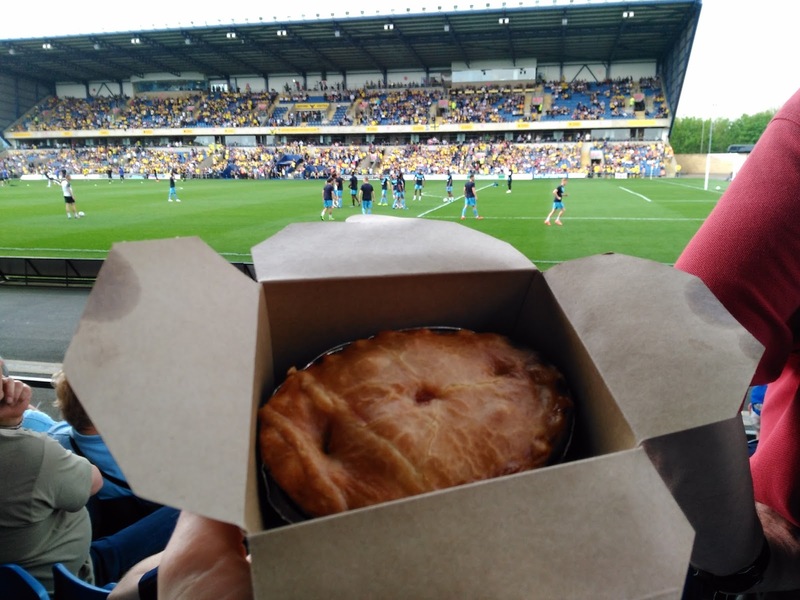 Once again Nice Pie have done us proud, producing two more Pierate Recommended pies AND a Pierate Highly Recommended pie! It's an absolute credit to Katharine and all who work at this small pie company that they are able to churn out top rated pie after top rated pie, and it's been great to hear about the success of their on-site Pie Shop and Cafe too! We hope to visit it one day soon! continue reading "Nice to see you, to see you, Nice Pies!" 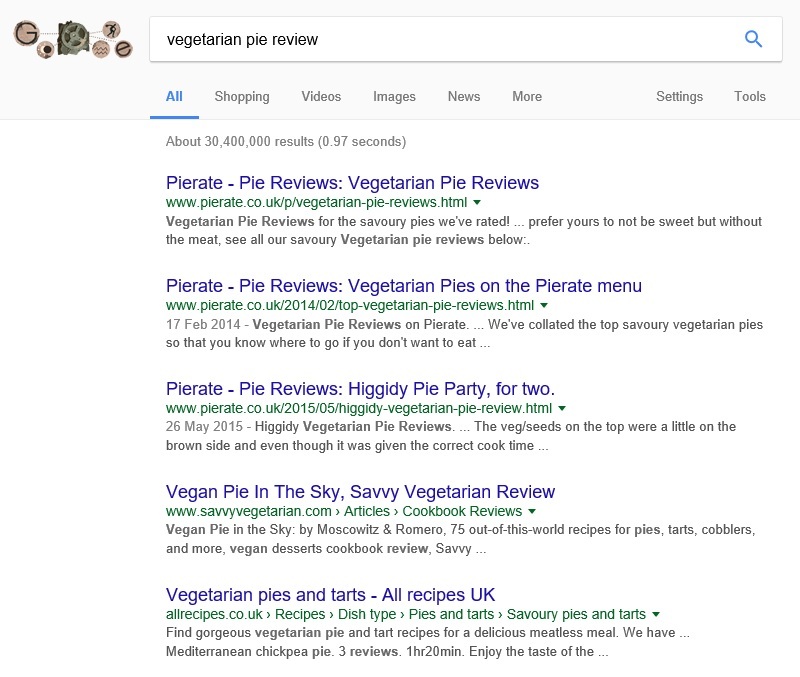 Pierate comes highly rated by Google for Vegetarian Pie Reviews! 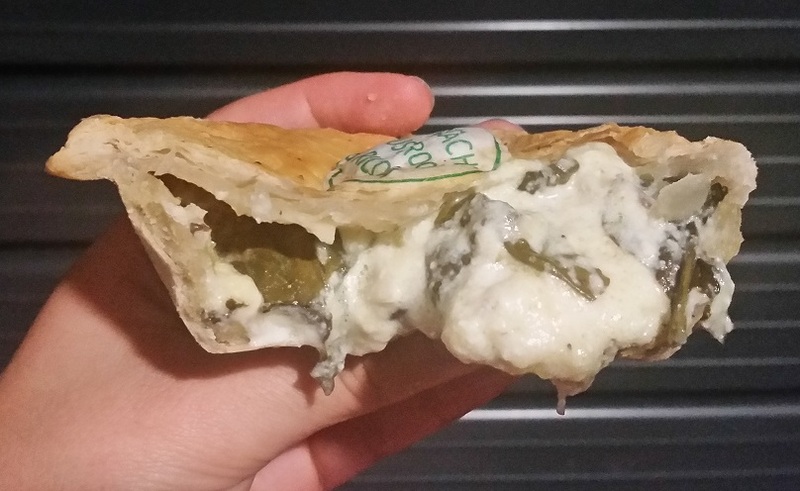 You may not realise but this week (15th-21st May) is National Vegetarian Week, so to celebrate we’ve collated our top savoury vegetarian pies so that you know where to go if you don’t want to eat meat! Below are our top 5 vegetarian pies as of today and links to the reviews, or you can view all our vegetarian pies here! We've rated a number of top vegetarian pies over the past couple of years and are glad to see vegetarian pies being taken more seriously recently, with a great standard of vegetarian pies at the British Pie Awards in March this year. As you can read about in our review of the Awards, our current number 3 veggie pie from MyPie London won the Vegetarian pie class, which was sponsored by the Vegetarian Society. 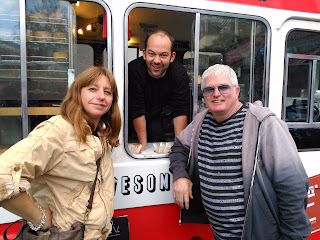 while Piebury Corner owners Paul and Nicky (outside the van) create our current #4! Here's our current top 5 savoury pies - though you can see plenty more vegetarian fruit pies by looking out for the "V" in our main pie rankings list of almost 600 pies!!! You'll also find that when you google "Vegetarian Pie Review" we're not just the first and second but also the third results! 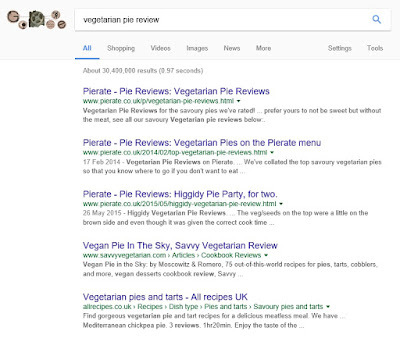 Clearly Google think we really are the home of the Vegetarian Pie Review! 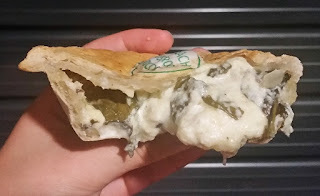 The results when you Google "Vegetarian Pie Review"
continue reading "Pierate is the home of the Vegetarian Pie Review!" Big Pie Party planned with a "star baker" and top rated pies! 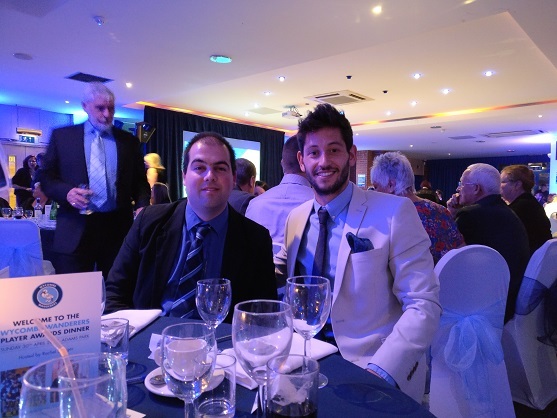 Sometimes you've got to plan early if you want the biggest names and the tastiest pies at your birthday pierty! Yes, it may sound uber keen planning six months in advance for our 11th November pie party, but when you've got a star baker coming you want to shout about it! 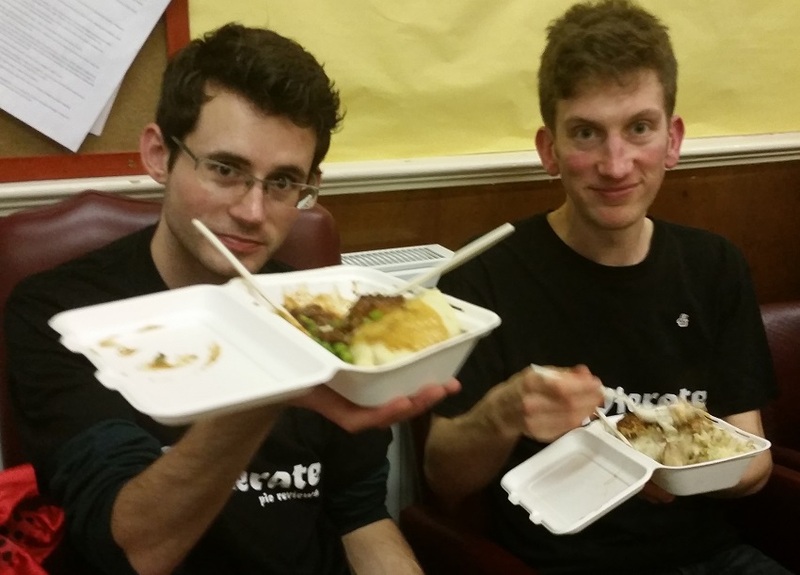 For the last few years we've been in contact over Twitter with GBBO Series 6 star Sandy Docherty about coming to one of our pie nights, and at last we've got a date in the diary! Sandy, for those who don't follow the show (or whose memory is a little hazy! 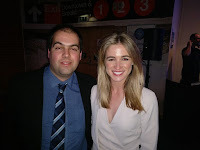 ), was the contestant who referred to her home baking in episode one with words to the effect of "everything I bake at home seems to turn into a pie!" And for some reason, that seemed to really strike a cord with us on the Pierate Ship!!! 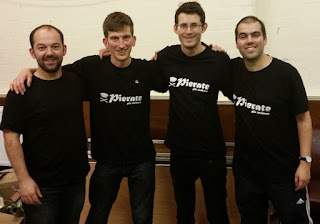 So while we had a break last year, we're delighted to once again be following the tradition of 2013, 2014 and 2015 in having a Pierate Birthday Pie-rty with friends and colleagues in just under six months time! 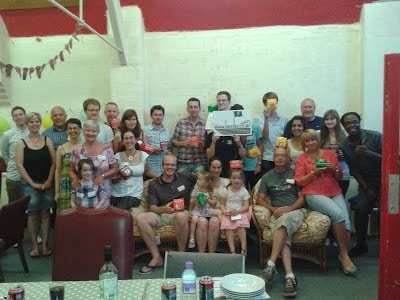 For those wondering what it will be like, here's our review from our 5th Birthday Pie-rty three years ago. 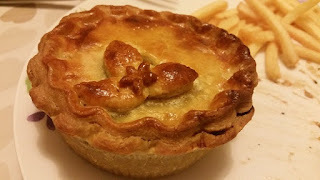 Yes, like in 2015, we've once again gone straight to the top of the Pie Rankings to find a Pierate Highly Recommended pie maker to supply the pies at our eighth Birthday Pie Party, with Chris' Free Range Chicken, Smoked Ham and Tarragon Pie rating at 6.39/7, his Venison, Chilli and Cheese Pie rating at 6.57/7 and his Steak and Ale Pie our current number 1 at 6.61/7! All three are in our top 10 out of almost 600 pies reviewed! And what's more, Chris has kindly agreed to donate the pies to us for a charitable donation, so when tickets become available the majority of the ticket cost will be split between two charities Chris will be selecting. Even better! 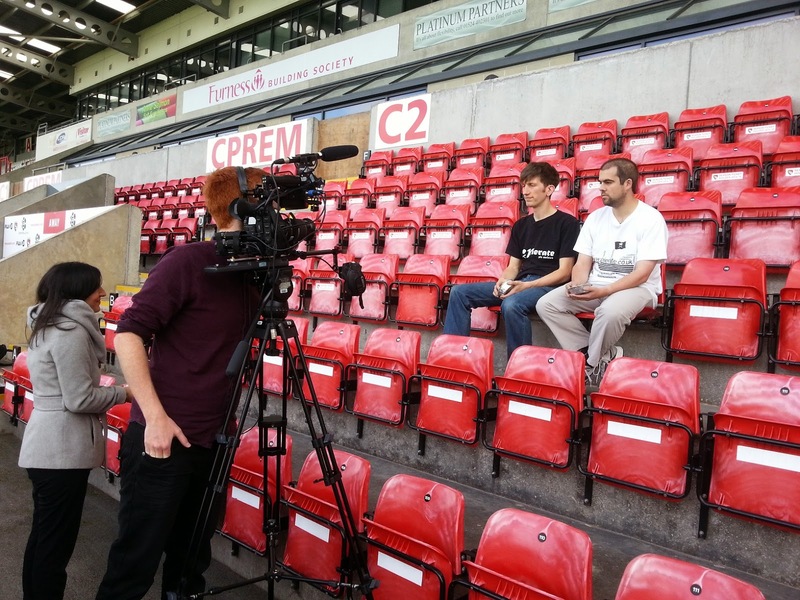 Ticket information will be released on www.pierate.co.uk nearer the event. As you can imagine, we can't wait til Saturday November 11th for what promises to be our best pie party yet!!! I couldn't be much more excited about this news unless Piebury Corner announced they were opening a store in my hometown of Birmingham! 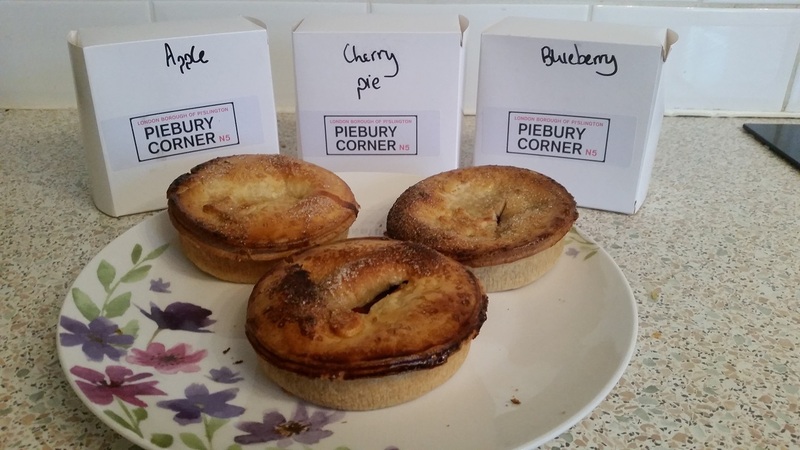 Having been huge fans of Piebury Corner since our first review there in February 2013, they have been churning out Pierate Recommended pie after Pierate Recommended pie - many of which are Pierate Highly Recommended and two of which make our top 5 pies out of 600! 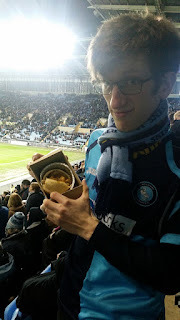 Check out all our Piebury Corner pie reviews in anticipation! It's not just Piebury Corner opening up a new store soon! 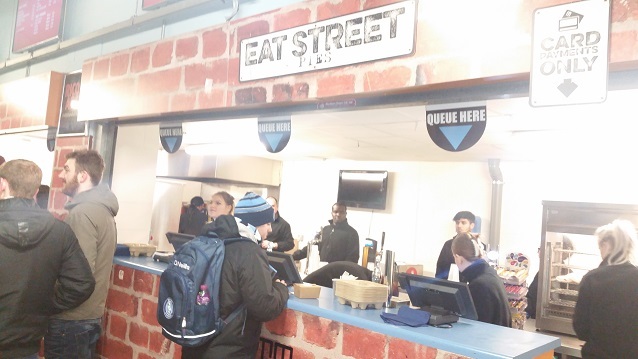 The wait is finally over and the premier pie chain Pieminister is about to open its first store in Birmingham! We can't wait to be VIPs (Very Important Pie-eaters) on Thursday night, when we get to sample their pies in their newest branch. 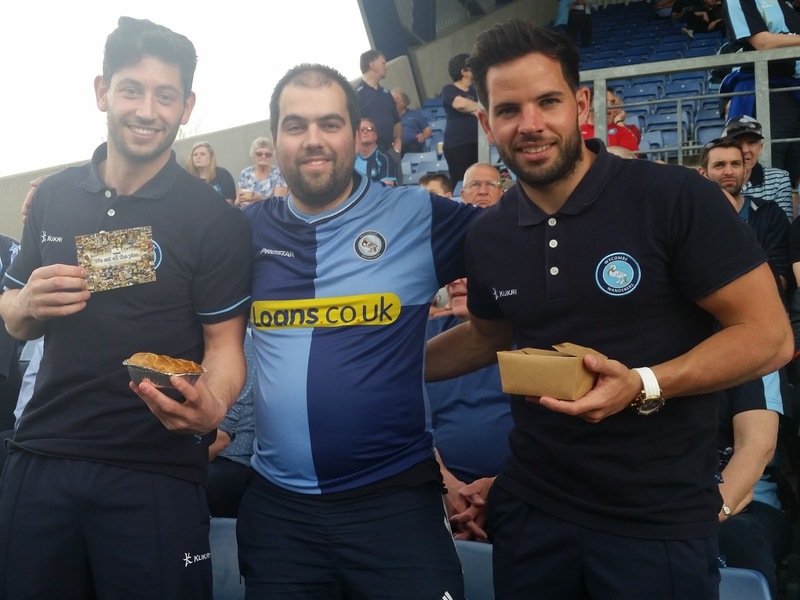 continue reading "GBBO Star & Top Pies To Headline Pie Party - Friday Pieday - 12th May 2017"
continue reading "Football Pie: Sent to Coventry"
continue reading "The Pies and Lows of following Wycombe Wanderers!"